Hi. My name is Shelby Lynn Boyce. I am twenty years old and I came into this world on October 15, 1991. I have had the luxury (yes, maybe there is a hint of sarcasm) of growing up with two dads and two moms because my parents were divorced before I was old enough to remember them together. I grew up being very close to my maternal grandmother. I called her Mama and she was “go-to”. I talked to her about everything. I learned what death was a young age. I watched my Papa lose both of his parents just months apart from each other. I watched my Mama lose her aged Aunt shortly after. My dad lost his parents too. However, the hardest death I faced suddenly was my Papa on September 10, 2007. Wow. I still can’t believe he’s gone sometimes. I had to watch my Mama crumbled emotionally and I was there to try to “listen” but how could I, at age 16, understand what it is like to lose your lifelong soul-mate? I lived with my grandma for nearly two and a half years for reasons I’m not going to discuss, but I wouldn’t trade those days for anything. I might have been stressed, I might have been pushed to the limit, but I was able to make parts of the last of her life comfortable. When I found out her cancer had returned in full force, I ran back into the fold of my mom’s house. I ran away when she needed me most and I still feel like a coward. She left me behind on October 9th, 2011 and I am still not used to her being gone. I miss her dearly. I wish I could just pick up the phone and call to check on her. Somebody needs to create a communication line from here to heaven. I bring all of this up for a reason. I learned what loss was when I was incredibly young and I have continued to lose things that I love. I am twenty years old and I do not have a single living grandparent. I get jealous when I hear people who are several years older than me discuss their still-living grandparents. Why didn’t I get to keep one of mine for just a little bit longer? I always imagined Mama being around for my college graduation, for my wedding, and for the birth of my children. Why? I have learned to live like I’m not affected by these things when I’m around people. Nobody wants to hear about my grief, my depression.. I’ll tell you if you are truly concerned. Otherwise, I just keep it to myself. I hate funerals. I don’t need your hugs or your apologies. When Mama died specifically, not many people understand the difference between the pain I felt and what they thought I felt. Nobody understood, it was my pain to feel, my pain to bear. I am twenty years old. I have acquired 5 tattoos, all of which mean more to me than I can explain. The art I represent on my body has deep meaning, they are more than just pictures. I also have two piercings in my face (much to my mother and father’s dismay). There are many things on the outside that represent who I am on the inside, but being fat isn’t who I am. Being fat is what I have done to myself by not understanding my depression and how to deal with it. Being fat is the consequence of not taking care of myself because I was “too busy” taking care of every one else or turning away from the fact I was really fat. Speaking of, I remember in middle school when my best friend used to ask me if she were fat. She was at least 7 sizes smaller than me… Yet she always asked me if she looked fat. Seriously? Do you realize how much I hated this question? I wanted to slap her. I also wanted to put her in my body. I am 5’2 and a solid seven sizes larger than you! Last night I was with my friends and they kept calling the smallest girl there, thunder thighs. I wanted to slap these people. They are calling girls that are tiny names that they should be calling me, yet they would never say it to my face. What assholes. According to my application I have lost 4.5 pounds in one week. If I continue to get rid of my weight like this, I will hit my weight loss goal in just 30 weeks. Right around the end of the summer I will be where I want to be, but the chance I will lose 4 pounds a week is unlikely. Maybe at the beginning, I will. Honestly, my biggest goal is to be able to wear something “hot” for my 21st birthday. 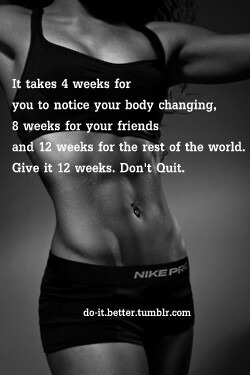 <—I wish my body would look that amazing at 12 weeks, but now I’m really dreaming. However, I am one week closer to noticing my body changing, 8 weeks for you to notice and 12 weeks for the rest of the world to notice the changes I’m making. Please, if you are reading my blog and can actually tell a difference in the way I look, please tell me. I’m interested to see if people really have the balls to tell me.